We had this salad as part of our dinner last night. Roast the beets wrapped in aluminum foil in a 400F oven for about 40 minutes. When cool enough to handle remove the skin using two paper towels. Dress the greens with a oil and vinegar with a touch of orange juice. 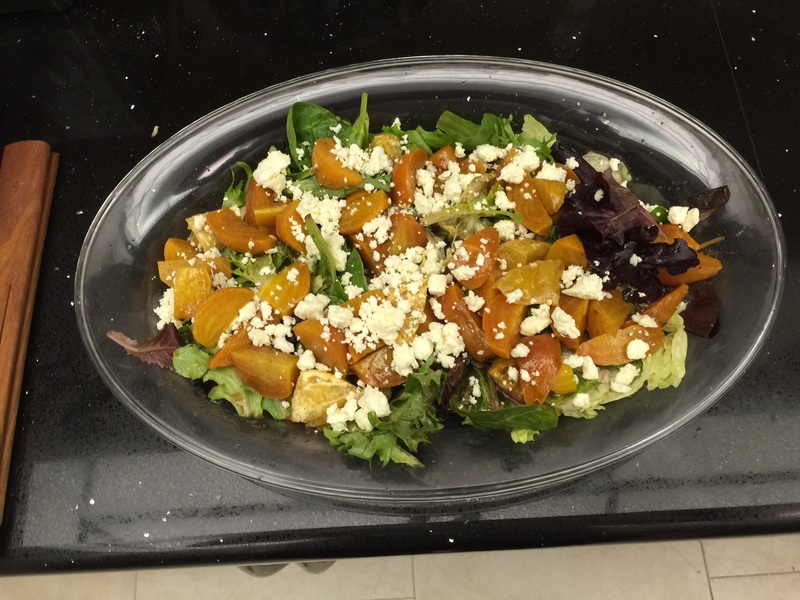 Compose the salad with the greens on the bottom, then golden beets, some orange segments, and feta cheese. (I also think some sort of blue cheese would be brilliant as well.) Not shown in the picture were also toppings of red onions and candied pecans. This entry was posted in Vegetarian and tagged Feta cheese, Golden beets, Salad, vegetarian. Bookmark the permalink.